Conserve Botswana Blog: How to Balance Biodiversity Conservation and Large Elephant Numbers in Botswana: No Extra Water for Elephants! How to Balance Biodiversity Conservation and Large Elephant Numbers in Botswana: No Extra Water for Elephants! Botswana's researchers contribute to the debate surrounding large elephant populations and their impact on the environment in southern Africa. An elephant in the Mababe floodplains in northern Botswana. Photo By Gail C. Potgieter. 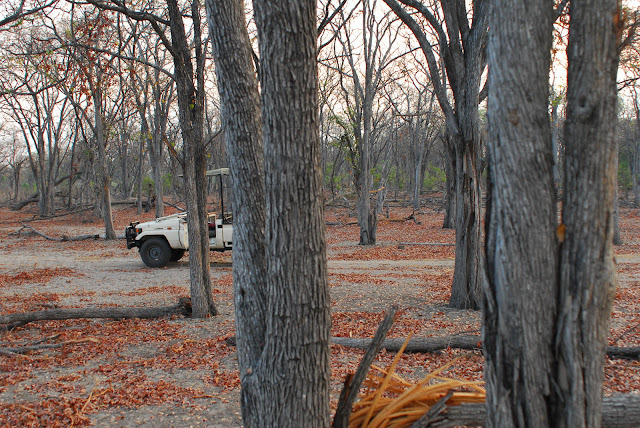 A Mopane woodland in October 2010 at a location in northern Botswana. Photo by Christiaan Winterbach. The same Mopane woodland in October 2013 showing large-scale elephant damage. Photo by Christiaan Winterbach. Avoiding emotionally charged debates based on little more than informed opinion, researchers from Botswana decided to tackle the critical elephant question head-on. Dr. Keoikantse Sianga and Dr. Richard Fynn of the Okavango Research Institute (a specialized department of the University of Botswana) joined forces with three Dutch researchers from Wageningen University in a vegetation study focusing on a large natural area called the Savuti-Mababe-Linyanti Ecosystem. This enormous area of nearly 30,000 square kilometres lies between the Okavango Delta, the Mababe Depression and the Linyanti Swamps, and therefore hosts a healthy proportion of Botswana’s elephants. The researchers doing field work. Note the elephants in the background! Photo by Jip Vrooman. One of the researchers measuring tree height. Photo by Jip Vrooman. A family of sable antelope in the wild in northern Botswana. Photo by Rob Thomson. 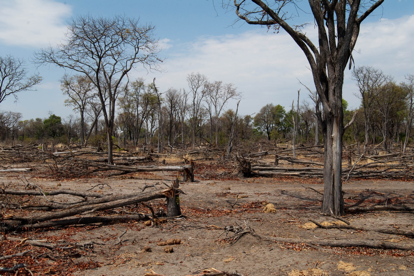 Artificial water holes and barriers to elephant movement (such as fences) are thus ultimate causes of ecosystem damage, rather than the elephants themselves, which simply respond to the available resources. Simply removing many elephants will not solve the underlying problem, so the population will keep rebounding and there will be an endless battle for the health of the ecosystem. Elephants enjoying a seasonal pan during the late wet season. When this pan dries up, they will move to permanent water sources in northern Botswana. Photo by Gail Potgieter. Full article reference: Sianga, Keoikantse; van Telgen, Mario; Vrooman, Jip; Fynn, Richard W.S. & van Langevelde, Frank. (2017). Spatial refuges buffer landscapes against homogenisation and degradation by large herbivore populations and facilitate vegetation heterogeneity. Koedoe, 59(2),1-13. Something I wrote quite some time ago for " Zambezi Traveler" , but I think they are not in business anymore. I do not understand that Botswana allows that all camelthorn trees at the Chobe waterfront are destroyed by the elefants by debarking. There is hardly any camelthorn trees alive, just sceletons remain. If you do go a bit deeper into the forest the camelthorns are nice and green ( mid october) whilst most other trees are bare and give no shade or food in a time of a bad spell of drought. Why don't the employees of wildlife department do anything against it like: putting barbed and or mashwire around the treetrunks at a certain hight, paint or spray the trunks with a chilli mixture, put stones or concrete pyramids or thick dead wood around the stems? It seems to me that the people are just present at work but not realy working itselves, thinking of what happened at Serondella campingsite and now Ihaha where the dustbins don't get cleaned in time and the baboons and monkeys become such a problem that you have to shift the whole campsite. The dustbins also need fixing at a regular interval. It's to easy to say: the tourist break everything and are not tidy. If you come to the central and western side of Chobe Waterfront there are still a few Baobabs left but they also get a hammering from the elefants and it woun't be long before they are all dead. Is that what the Parks are all about? It's a nature park and not just a game park, or am I wrong? The guys working there should also be nature rangers or environmentalist and not just gameranger or game guards! I don't see any attempt that they do anything for the plight of the Chobe Waterfront. About the camelthorn sceletons standing, what about planting stranglerfigs next to the stem and maybee it would be possible that stranglerfigs will grow and take over. At the moment you might argue and say: we have more than enough tourist coming, so we are doing something right. But the tide will change, north Africa will one day open up to tourist again and become popular and less people will want to come and see parks that are neglected and run down and no healthy nature to be seen because it looks more as if an atomic bomb has hit the place. If I think of the new tarred road from Ngoma to Kachikau I want to congratulated the department in charge for a good job, the road is nice and a pleasure to drive because the bush is cleared at the same time and now the Baobabs are standing out and you can see the flodplains. That realy makes the drive along that stretch so much nicer, it opens up your sole. Before you just drove through the dense bush and clients thought its just boring. At Savuti campsite there was mash wire put up around the trunks of the camelthorntrees , but now that needs some maintenance. You can't do something positive and then forget about it, you have to nurse it permanently. Otherwise you will have no more shade trees at Savuti campsite left. Botswana generates enough money from tourism so you can surely plough back some of it to buy the material that would be needed for these projects and put your staff to work and let them earn their salarys.